A3 Size 10.7 x 15.6 in. (272 x 397 mm) 11.7 x 16.5 in. (304 x 442 mm) 13 x 19 in. MEDIUM 14.4 x 21 in. (336 x 533 mm) 17.5 x 24 in. LARGE 20.25 x 29.5 in. (515 x 750 mm) 24 x 35 in. THANGKA 20.2 x 30 in. (513 x 762 mm) 20.2 x 30 in. An identical version of this rare and exceptional composition by Sunlal was available for sale. This truly was a real masterpiece of contemporary Tibetan Art, with an amazing amount of precise detail, and should be framed behind glass. Priced at GBP £3,950.00. Amitabha (Tib. Od dpag-med), the Buddha of 'Boundless Light', is the 'Lord of the Padma or Lotus Family' who presides over the western direction where his paradise of Sukhavati is located. Amitabha Buddha is red in colour, his seed syllable is HRIH, and he represents the aggregate of perception or discrimination, and the transmutation of attachment into the wisdom of discernment or discriminating awareness. He sits on a peacock throne, his symbol is the red lotus, his gesture is the dhyana-mudra of meditation, his prajna or consort is red Pandara, and his principal bodhisattva or 'spiritual son' is Avalokiteshvara. As one of the Five Buddhas he is also identified with the faculty of taste, the tongue, the summer season, evening twilight, and the throat chakra - which is equated with the sambhogakaya aspect of speech. Amitabha appears at the centre of this composition, wearing the three red patchwork robes of a Buddhist monk and a green shawl that is draped over his right shoulder. He sits in vajra-posture upon a white moon disc, a multicoloured lotus, and a jeweled throne that is adorned on each of its four sides with two young peacocks. His hands rest upon his lap in the dhyana-mudra of meditative equipoise as he holds an alms-bowl made of the vaidurya gemstone (blue-beryl), which is filled with the cascading white nectar of immortal wisdom. Golden light rays emanate from his divine body against his blue inner aura, which is encircled by the golden scrolls and jewels of his outer aura, while a colourful net of gemstones and two jeweled yak-tail pendants hang in front of his green halo. On each side of Amitabha appear four of the 'Eight Close Sons' or great bodhisattvas, two of which - white Avalokiteshvara and blue Mahasthamaprapta (Vajrapani) - are his principal attendants, and they sit facing forward as they flank Amitabha to his right and left. Next to Avalokiteshvara is orange Manjushri, who holds a large book; and below them is red Samantabhadra (left), who holds a lotus that bears a golden flask; and blue Akashagarbha (right), who holds the stem of a blue lotus. Next to blue Mahasthamaprapta is orange Maitreya, who wears a deerskin sash and holds a lotus that bears a golden flask; and below them is yellow Kshitigarbha (left), who holds a lotus that bears a jewel; and white Nivarana-vishkambhin (right), who holds a blue lotus. Encircling the enthroned form of Amitabha Buddha is a halo of rainbow light, within which appear some of the beautiful palaces, mansions, lakes, heavenly gardens, and the groves of sweetly scented medicinal trees that adorn his western paradise of Sukhavati. The Pure Land of Sukhavati (Tib. Dewa-chen), meaning the 'Blissful Realm', is believed to be the only Buddhist paradise that can easily be attained by those who are still progressing on the path to enlightenment. The four devotional causes that can create a karmic link to an imminent rebirth in Sukhavati are a strong aspiration to be reborn there, the cultivation of bodhicitta, and the accumulation and dedication of merit. But the practice of phowa or 'transference of consciousness' is believed to be the most direct method for entering Sukhavati at the time of death, where devotees are spontaneously reborn within lotus flowers in male or 'sexless' forms with golden bodies. For those whose karma is most ripe the lotus petals are fully open, but others take rebirth within the closed petals of a lotus bud, where they can at first only listen to Amitabha's teachings. When their karma is ripe the lotus petals spontaneously open, and then they experience the bliss of a 'full rebirth' in Sukhavati. What this experience implies can be glimpsed by the hundreds of 'genderless' monks who mingle with the gods and fly blissfully through the sky, some bearing their alms-bowls and staffs, others the divine silk and jewel attributes of the gods. 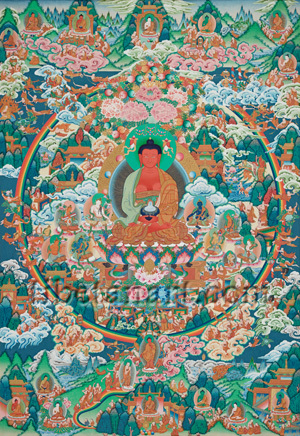 Across the top of the painting are assemblies of seated, standing and cloud-borne monks who have gathered to listen to the teachings of various Buddhas, some of whom appear in the blue, white, yellow, red and green aspects of the Five Buddhas. Enthroned at the bottom centre amidst a dense grove of trees is Shakyamuni Buddha, whose profound teachings inspire many fortunate beings to ascend a rainbow path that leads to the threshold of Sukhavati, where Amitabha stands waiting to greet them, with his right hand extended in the varada-mudra of supreme generosity. The Five Buddhas also appear within the beautiful lower landscape of this painting, which is enhanced by the natural elements of hills, mountains and rock formations, waterfalls, rivers and lakes, billowing clouds and fire, and the eternal presence of countless divine beings. The clouds that appear outside the rainbow are populated by monks and gods, who hold various banners and parasols that are fashioned from multicoloured silks, yak-tails, peacock feathers, precious metals and jewels. The ground of the Pure Land inside the rainbow is golden in colour, with many beautiful pavilions, fenced pavements, groves of medicinal trees, rainbow-coloured clouds, rivers and lotus lakes providing a perfect environment for the teachings of Amitabha Buddha to be harmoniously transmitted and received. Ascending above Amitabha's halo is the canopy of a wish-granting tree that is laden with fragrant blossoms, leaves and lotuses, a profusion of multicoloured fruits, and a faceted wish-granting gem that blazes with light. In front of Amitabha's peacock throne is the walled enclosure of the lotus-pool where the most fortunate of beings take spontaneous rebirth. Two of these beings are shown kneeling in adoration on either side of the golden wheel that adorns the upper lotus. Some other interesting scenes that appear in this composition include: gods bathing in a lotus-lake; a seated Arhat emanating fire and water; monks miraculously lengthening their arms, shape-shifting their bodies, resting upon floating leaves, and like the gods being able to create or manifest any auspicious object through the power of their will.